I'm starting the day with Christmas. In 2007 when I found Addicted to Rubber Stamps they were offering this package deal on 7 sets of See-D's Christmas stamps at a super bargain, how much you ask, well, I wasn't keeping up with things like I am now because that info wasn't relevant to anyone but me. Addicted to Rubber Stamps already has great deals and if you don't know about them click on the link and go visit, they run all kinds of specials all the time. These are the majority of my Christmas stamps so you'll be seeing a lot of them on my Christmas cards and projects. Supplies: Card Blank Green 51/4" X 71/4" Primary Color Value Pack Hobby Lobby, patterned paper from my scrap box, Stampin Up-Whisper White card stock, Ink: Ranger Archival Ink-Jet Black, VersaMark Ink Pad, CTMH gold embossing powder, ribbon-Hobby Lobby, small gold star brad, Stamps: See-D's #50316 Traditional Christmas, CTMH-D1333 Wishing Star, Sakura Gelly Roll Pen-Clear Star, Gold, Sharpie Poster Paint Pen-gold, Stampin Up marker-ruby red, CTMH markers-sunkiss yellow, clover meadow, parchment, spring iris, brown bag, vanilla cream, desert sand, black, topiary, glue dots. Just gorgeous Beverly! Great way to get started on those holiday cards. So glad you could join us on CP. Thanks for joining out bling challenge at 3CTC this week...great card! 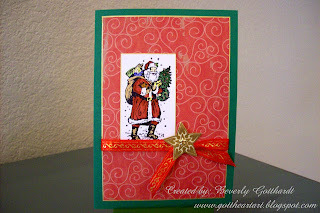 Gorgeous Christmas Card, I love the colours you have chosen. Thanks for joining us at CCC.